I’m not the most active person in the world,, but since gaining a few pounds over the festive period one of my goals was to be more active in 2015. 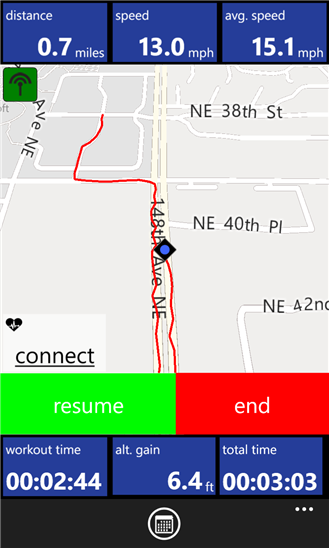 I have been using CycloMeter as an aid when I go on a bike ride with my dog, coupled with the run feature on my MS Band you are able to do much more than just track where you have been. With CycloMeter you can race against yourself on any of your regular bike rides, I am fortunate enough to live adjacent to a dis-used railway that has been converted into a cycle-path and so I try to get out and ride at least twice a week. The main benefit is the audible info about your ride, meaning you don’t need to look at anything other than where you are going. When you complete a ride, its easy to check out your stats like average speed, or distance travelled. There is a historical chart that shows every saved ride, plotted to show individual routes travelled and historical speed and distance data. 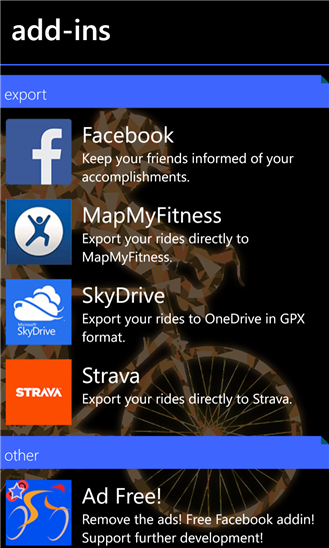 There are a range of In-App Purchases available, from MapMyFitness integration to OneDrive GPX cloud uploads, and a ‘Go-Pro’ option for £3.49 which not only makes the app add-free, it also gives you the £0.79 Facebook add-on for free. • Race against Yourself, where you record and then race against your previous record! 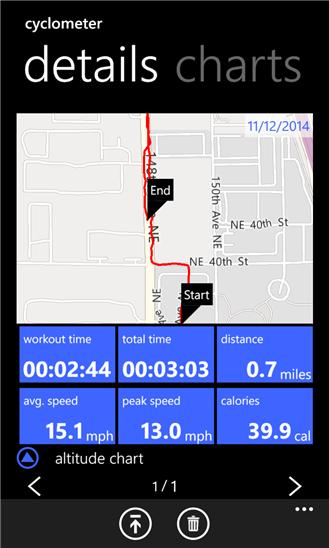 • Audio readout of ride stats, to allow you to keep the phone screen turned off, maximizing the battery life. 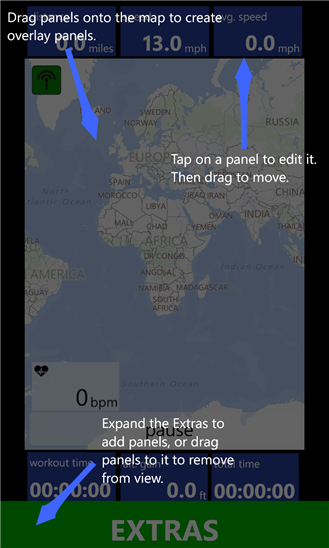 • Track your ride on a map. Uses the new Nokia Map, allowing Nokia phone users to cache their maps offline, minimizing data and battery usage. • Keep track of vital ride statics, such as average speed, peak speed, current speed, exercise time (time moving), total time, and calories burned. • Analyze your previous ride record through easy to use charts! • Full support for Metric and Imperial measurement systems. If you are struggling to find the motivation to get out on these short days, maybe this will help. Thank you for your honesty, you have been noted.